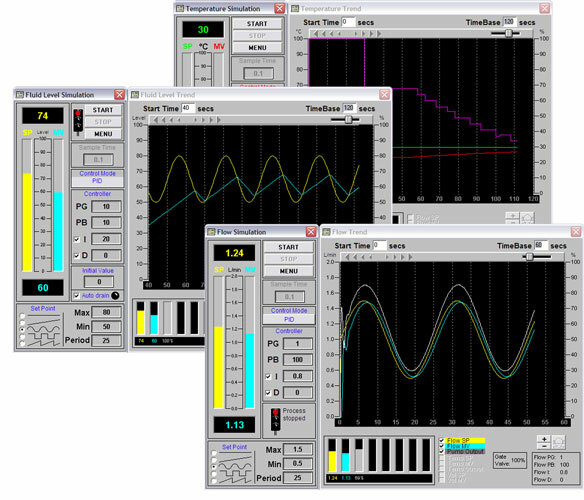 PCUSIM is a simulation software used to teach process control. The program is aimed at further and higher education students learning process engineering and process control using Three Term Control (PID) methods. PCUSIM has a graphical display of all data in real time. Graphs can be analysed, rewound, saved and printed. Experiments for flow, level, temperature and batch can be performed. Students can perform the same experiments many times with the same initial condition and different control parameters, allowing closer comparisons of outcomes. For each of the control screens in flow, level, temperature and batch, displays show : start and stop buttons, the control module, the principle variables being measured, PID parameters, set-point; real-time graph with start time and time base, state of current reading and reading being examined with tick boxes for each traces to displayed. Courseware manual and build in help files provided to allow students to proceed without full time supervision.